During low solar minima, the 40m band becomes very poor for reliable NVIS QSOs, but what of the prospects of ground wave QSOs? ITU-R. Jul 2015. Recommendation ITU-R P.372-12 (7/2015) Radio noise. ITU-R. Feb 2007. 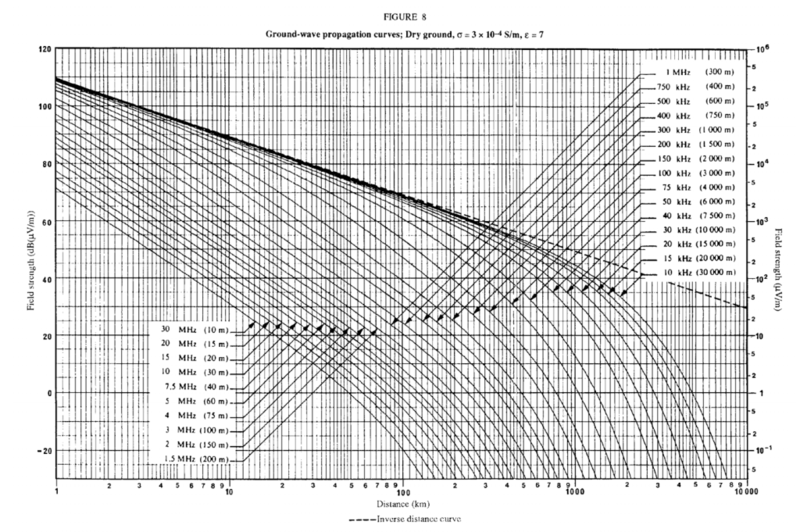 Recommendation ITU-R P.368-9 (2/2007) Ground-wave propagation curves for frequencies between 10 kHz and 30 MHz. The first sets out expected median ambient noise in a range of precincts. It is based on measurements made with a short monopole, ie a vertically polarised antenna. The second sets out the attenuation of ground waves at HF. 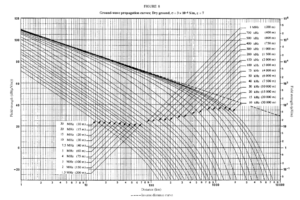 Whilst P.368-9 publishes a set of graphs like the one above for a limited set of grounds, they also publish a program to calculate values for the user’s choice of ground and that is what was used for this article. This scenario is for a quarter wave vertical at transmitting and receiving stations. Above is the calculated average S/N ratio for the three precincts most likely to contain ham stations. 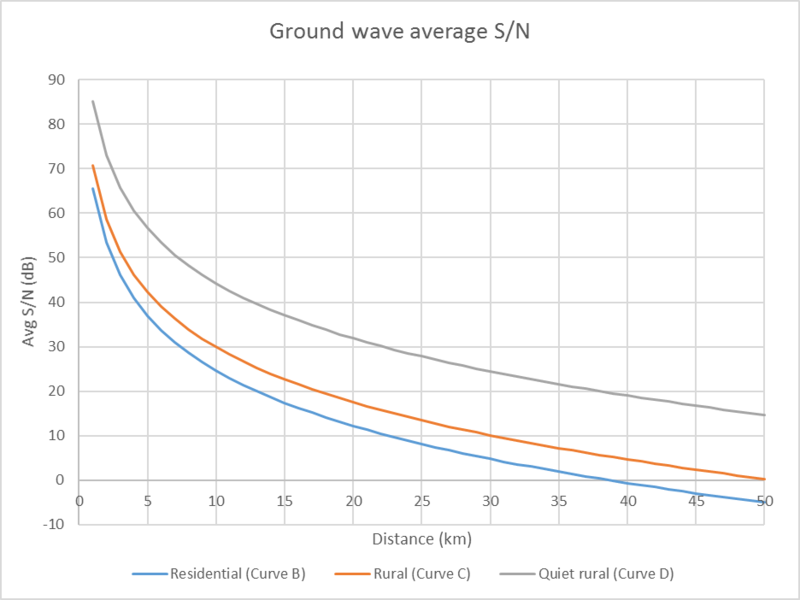 It can be seen that in the Quiet Rural precinct, S/N is above 10dB out to well beyond 50km and ground wave communications to that distance is workable under those conditions. The Residential curve suggests a limit of more like 22km. This scenario is for a horizontal half wave dipole at transmitting and receiving stations. There is a significant issue with the assumption of P.372-12 ambient noise, and it is based on measurements with a vertical antenna, and horizontally polarised antennas will tend to pickup less noise. Above is the calculated average S/N ratio for the three precincts most likely to contain ham stations. 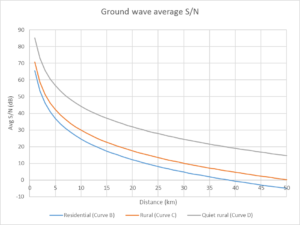 It can be seen that in the Quiet Rural precinct, S/N is above 10dB out to about 22km and ground wave communications to that distance is workable under those conditions. The Residential curve suggests a limit of more like 7km. For the same reasons as the horizontal signals are weaker over the path, so will ambient noise due to ground wave noise at greater distances, less so very close to the receiver, so it is likely that the ambient noise is a little lower than P.372-12 predicts and that ground wave range may be a little greater than suggested by the graph above.